Indiegogo No $ 4% if you reach your target, 9% if not. Extra fees apply if you’re not in the US. Kickstarter Yes $ 5% Note: you need to be a US resident. We Fund Yes £ 5%? Their website isn’t very clear about this. Note that most if not all of these sites charge sponsors a Paypal/Amazon fee on top of their donations. Crowdfunding sites fall into two categories: “all or nothing” and “keep it all”. “All or nothing” sites return the money to the sponsors if you don’t reach your target by the deadline. It would have been impossible to make the film for less than £2,000. Even as it is we have to raise further money. A ticking clock motivates sponsors, particularly towards the end of a campaign. Undoubtedly many of the people who donated at the eleventh hour did so because they didn’t want to see us fail and get none of the money. If we would have got the money regardless, I’m sure some of those people wouldn’t have bothered contributing. 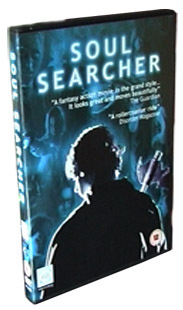 DVD copies of Soul Searcher were amongst the rewards. And why did we choose Crowdfunder over the other “all or nothing” sites? Mainly because Sophie’s successful Jar of Angels campaign had run on there. Also we were keen to use a site that works in sterling, because we knew most of our sponsors would be British and we thought some of them might be put off by a foreign currency. It was only when the campaign was running that I realised Crowdfunder could be a little more streamlined. Two or three people contacted me to say they wanted to donate but couldn’t figure out how to do it. There’s no “fund now” button unless you’ve set up an account and logged in – and having to set up an account in itself puts some people off, although Crowdfunder has one of the quickest account set-up procedures I’ve ever seen on a website. I’ve sent this feedback to Crowdfunder and hopefully they will be able to act on it in the future. 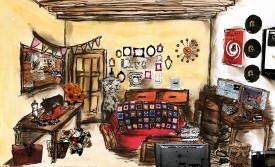 A signed print of this artwork by Sophie Black was one of the rewards. Finally a word about the rewards. 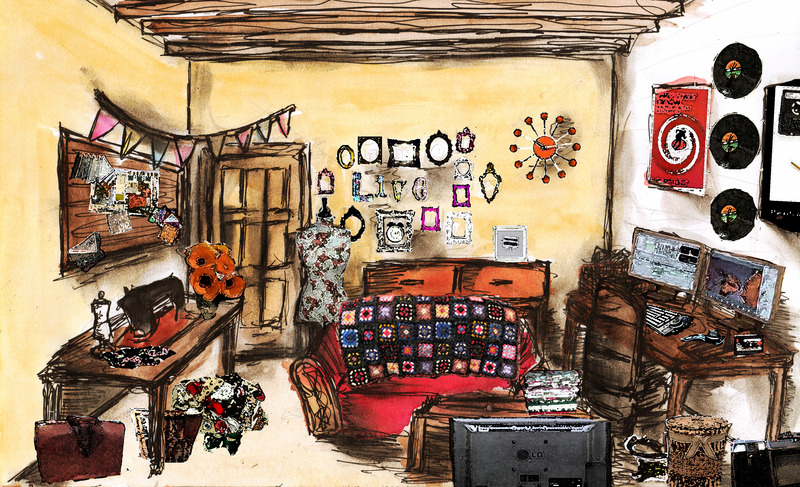 We wanted to be able to send out the rewards pretty quickly after the campaign finished, so we didn’t offer anything tied to Stop/Eject itself except a thank you in the credits and a print of Sophie’s living room artwork. Instead we offered downloads and DVDs of my previous films, signed posters, and even 35mm frames from The Dark Side of the Earth‘s pilot. Coming up with original and enticing rewards is very difficult. I’m not sure the ones we came up with were anything special, but fortunately people don’t tend to donate for the rewards. Most people just want to be part of something and help out, in which case rewards that involve them in the film – visit the set, be an extra, DVD copy, premiere invite, etc. – are probably the best way to go. I think that’s what I’ll offer next time. I hope you’ve found these evaluation blogs interesting. Let me know how you get on with your own campaigns. Meanwhile, I’ll be back soon with news of the other fund-raising efforts which will soon kick in for Stop/Eject.